Last year, Miller Lite brought back its classic "It's Miller Time" tagline and retro packaging with a Twitter campaign that turned social photos into a TV commercial. Today, the beer brand launches its summer campaign by buying Twitter's Promoted Trend, which costs roughly $200,000 for a one-day run, to encourage people to share their favorite summer-themed photos with the hashtag #ItsMillerTime. 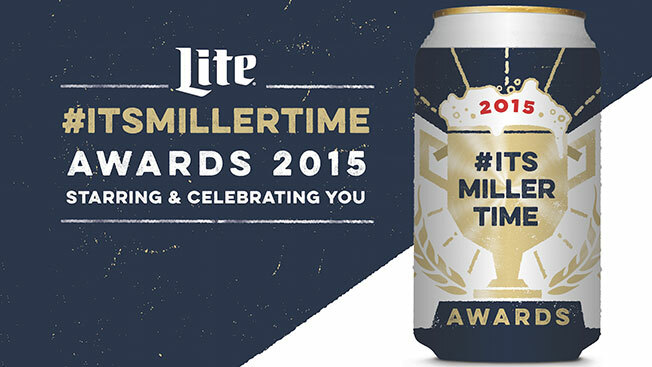 "Last year, we wanted to reintroduce America to 'It's Miller Time'—it's a tagline that's been with the brand for a long time but one that needed help to reconnect with consumers," said Miller Lite brand director Greg Butler. "[This program] gets us closer to our fans, but it also allows our fans to really own the brand and start to define what it means to be Miller Time." Butler described today's planned social blitz as a Twitter awards show—photos will be judged in six categories including best summer games, best BBQ and best #TBT. The beer brand and DigitasLBi will monitor tweets in real time all day in the agency's BrandLive Center and give out a total of 15 prizes including Nascar tickets, grills and beer can koozies. Once the team awards a prize, the winner will be asked to tweet back an "acceptance speech" using Twitter's built-in video player. "It's really going to have that thematic of an award show format," said DigitasLBi's vp, account director Marlon Millhouse. A similar user-generated content push last summer culminated in a TV spot made from photos shared on social media. This year, pre-roll, online and digital out-of-home ads featuring consumers are planned. "The difference over last year is that we're updating and refreshing this content more often, so more UGC is shared more often—more people are seeing us sharing their summer," Millhouse said. While Miller Lite isn't running a TV commercial this year, the $200,000 Promoted Trend is still a relatively expensive ad buy in terms of social media. And, as the backlash against T-Mobile's recent Promoted Trend showed, it can be a risky move for brands if the tweets are negative. Jen Choi, senior social marketing manager at Huge, also pointed out that it can be tough to drive contest entries for efforts like Miller Lite's campaign. "Adding an engagement-centric layer like this beer brand's summer contest can result in complications, because it's difficult to steer the conversation through a Promoted Trend and even more difficult to get users to take additional actions," she said. Kerry Perse, U.S. director of OMDsd Word, had a different take on Promoted Trends, though: "Using this ad product, a brand is able to instantly achieve scale with a specific topic for a 24-hour period and is worth the investment if their objective is awareness. This should prove to be an excellent way to drive contest entries." Either way, it will be worth watching today to see how Miller Lite fares on social media and whether the buzz translates into more summer beer sales.